The latest 2K Sports game will let you pit the 1992 and 2012 Olympic Basketball teams against each other. When in comes to sports games, there's a very common perception that these titles are little more than $60 annual roster updates. The critisism isn't an unfair one. After all, the gameplay and rules of Basketball hasn't been changed or updated significantly during the history of videogames. So if you do want to release a sports game, what can you do to make it stand out from previous iterations? 2K Sports is taking a unique approach in its upcoming NBA 2K13 with the addition of two Olympic Basketball teams, including the 1992 Barcelona "Dream Team". For those outside of the sports world who may not be familiar with the Dream Team, the term refers to the first American Olympic Team to feature active NBA players. Built from some of the best NBA players at the time, including Michael Jordan, Magic Johnson, Cylde Drexler, Karl Malone, Chris Mullin, David Robinson, and Charles Barkley, the team won the Gold Medal and went on to be called one of the greatest sports ever assembled. "The experience we shared in Barcelona is truly one of the highlights of my career," Michael Jordan said of his experience. "Being able to represent not only my country but basketball as a whole is an honor that I will never forget." 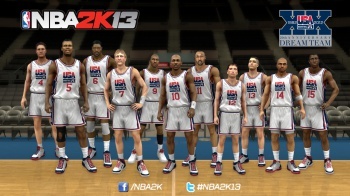 NBA 2K13 will also include another gold-winning team in its roster with the 2012 US Olympic Team, generating the inevitable question of what would happen if this year's team were to face-off against the Dream Team. "The fantasy matchup between the legendary 1992 'Dream Team' and the 2012 USA Men's national team has become one of the greatest sports debates of our time," stated new Executive Producer Jay Z. "In NBA 2K13, we're giving fans the opportunity to play as two of the best teams ever assembled in sporting history, literally putting the debate right into their hands." I've never been a huge sports fan, but I do recognize that that the creation of the Dream Team was a hugely influential event both to the Olymics and to the sport on the whole. Adding widely recognized teams from the past to contemporary games might give NBA 2K13 an edge in the genre beyond continually updating the roster, and being able to pit them against this year's gold-winning team is the icing on the cake. With luck, perhaps this is an idea that other sports developers will adopt to add a little more depth to their own games. That's how we play in the NBA 2K! The problem between these comparisons is that the '92 team will be rated compared to everyone else in '92, not 2012. 2012 could be infinitely better, but with better competition, and so could be lower rated than the '92 team. These things never work... Sadly... Could still be cool, though.